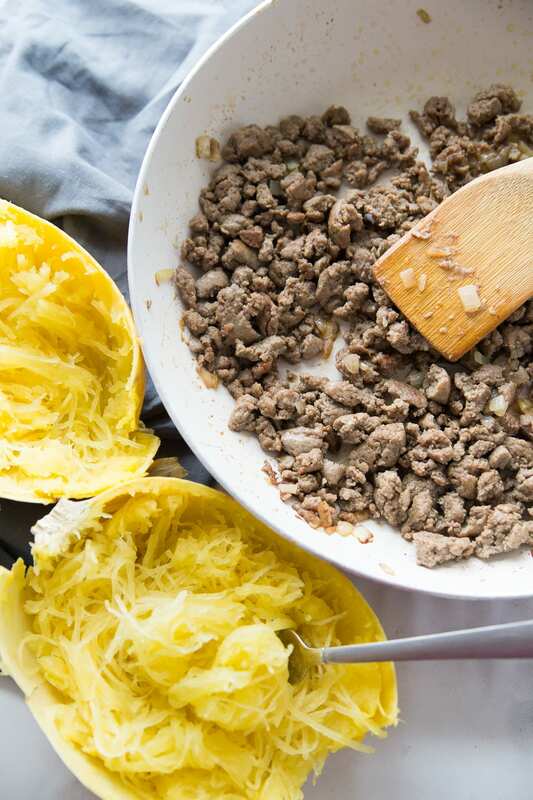 Get all the flavors of lasagna with this low carb, 21 Day Fix Spaghetti Squash Lasagna dish! 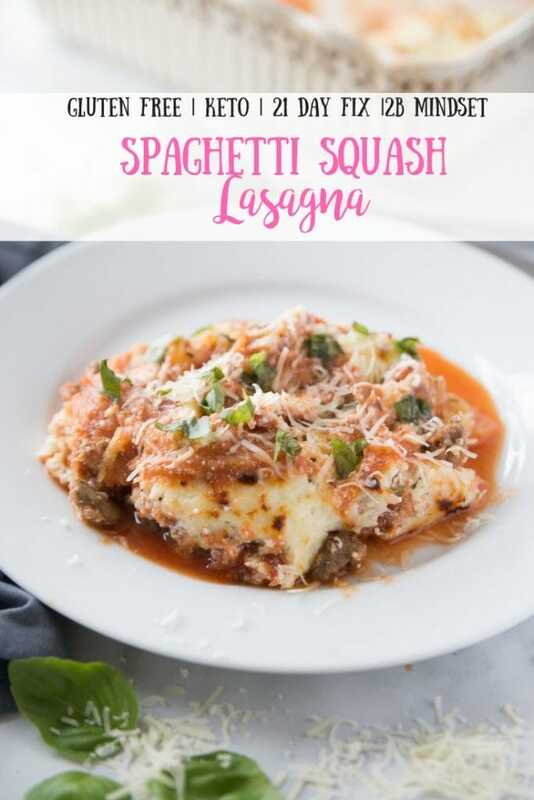 It’s gluten-free, grain-free, keto friendly and perfect for anyone who wants to indulge in delicious pasta dinners without the carbs. This post contains affiliate links for products I’m obsessed with. This post has been updated with new photos…same yumminess, just prettier now! Confession # 18- This week isn’t going as planned. I know it’s only Tuesday, but I’m just saying. And I totally didn’t mean to leave you all hanging with that pic of my delicious 21 Day Fix Spaghetti Squash Lasagna on Facebook without the recipe…that is just mean! So I’ll spare you the details of the stomach virus that has hit my home if you promise to forgive me AND try this recipe and let me know what you think. Because it’s definitely one of my favorites. 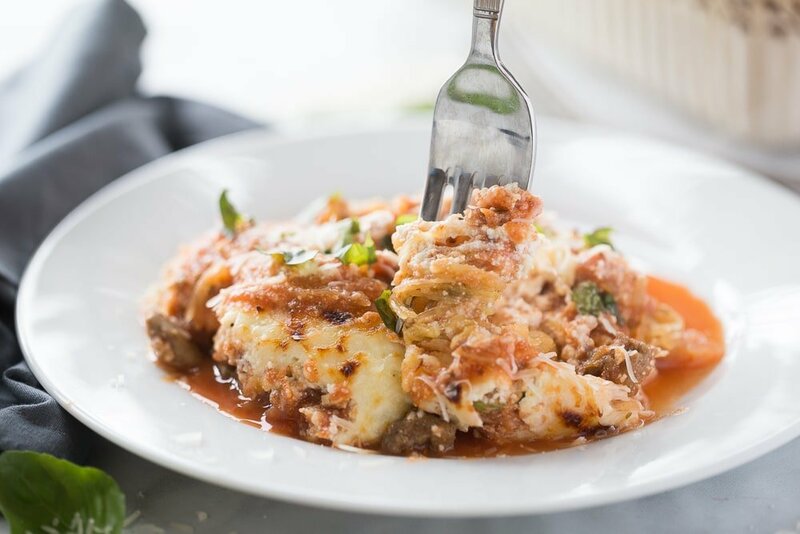 Just take some spaghetti squash and sautéed chicken sausage and layer them with all the traditional lasagna deliciousness – sauce, and a delicious layer of cheesy goodness. Then just bake until the cheesy is bubbly brown and the smell becomes so intoxicating, you can’t wait a moment longer. And that’s it! Super easy and soooooo good. The perfect Sunday comfort food before all hell breaks loose the next day. 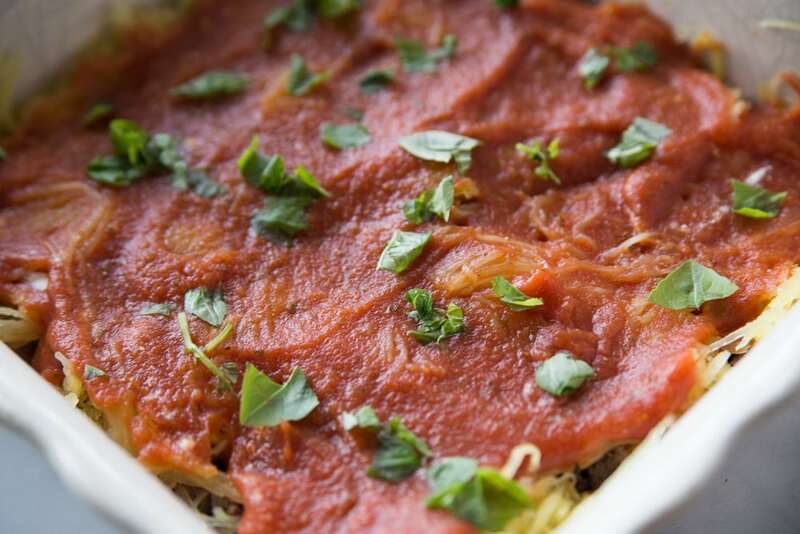 Oh – and a serving size of this is 1/4 of your pan…so come hungry, friends! 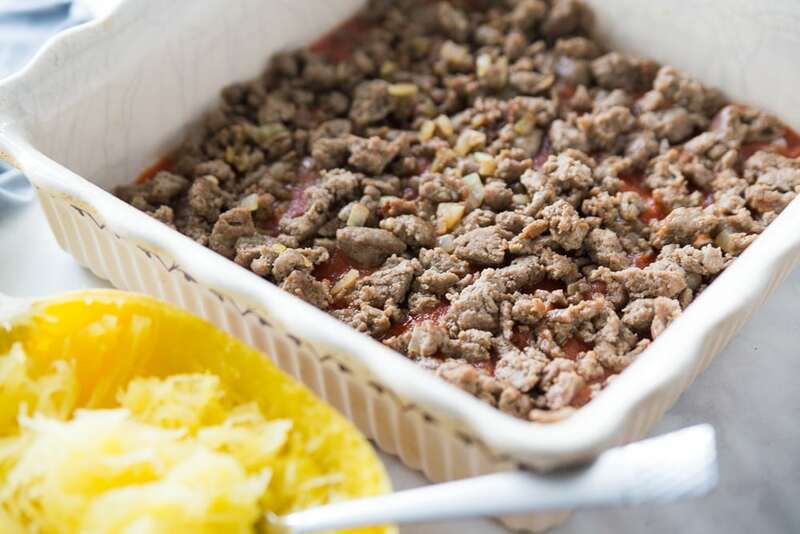 Get all the flavors of lasagna with this low carb, 21 Day Fix Spaghetti Squash Lasagna dish! 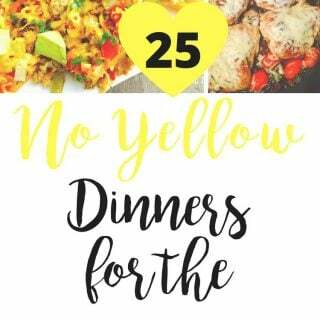 It’s gluten-free, grain-free, keto friendly and perfect for anyone who wants to indulge in delicious pasta dinners without the carbs. Spray a pan with olive oil cooking spray, saute onion until soft. Add turkey sausage and brown until cooked through. Add garlic and cook for an additional minute. Remove from heat. Discard seeds from the squash and use a fork to remove your “spaghetti.” To remove excess moisture from the squash, place it in a clean kitchen towel and give it a squeeze. Then season the squash with a little salt and pepper. 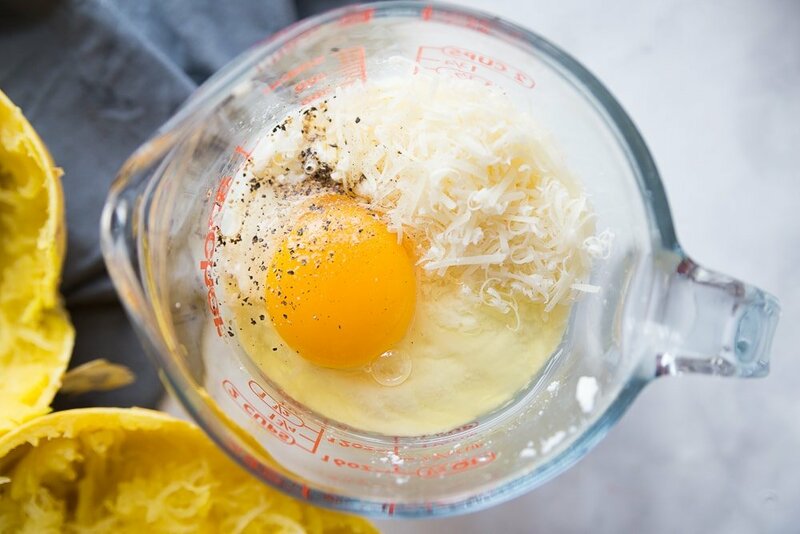 Stir an egg, parmesan cheese, and a sprinkle of pepper into the ricotta. Preheat your oven to 375. Spray a casserole dish with a olive oil cooking spray and begin the layering process. First, spoon about half of your sauce on the bottom of the casserole dish. Next, add the cooked sausage. Layer spaghetti squash over the sausage then add the rest of the sauce and some fresh chopped basil. Finally, top sauce with the ricotta cheese mixture and then add the shredded mozzarella. 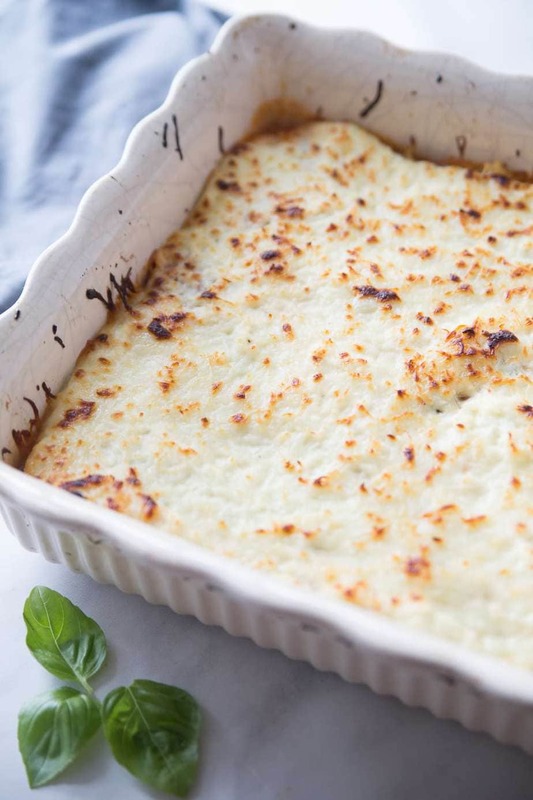 Bake until cheese is melty and bubbly – about 15-20 mins. To brown the cheese, broil on low for 5-10 minutes at the end, but watch carefully. It sneaks up on you! Remove from oven and let sit for a few minutes. If there is excess water at the bottom of your pan, you can carefully try to drain it out from the corner of the pan or serve with a slotted spoon. Garnish with fresh basil before serving! Is the sauce a purple or green? I see where they are either. Homemade sauce is a GREEN because it doesn’t have added sugar. If you buy a jar of sauce, it counts as a PURPLE. My sauce is my grandmother’s recipe – so easy and inexpensive! Try it! If you buy a jar of sauce, but it has no sugar added would it then still count as a green? Am i missing where your homemade sauce recipe is located??? 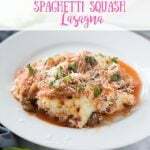 Would love to know how to cook spaghetti squash for this recipe. I have never cooked this before. Hi Kelli!! Here’s how I make my squash – 1. 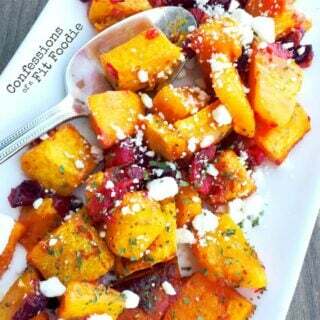 Using a sharp knife, cut slits all over the squash. 2. Microwave for 10-20 mins- checking periodically. When it’s done, it will feel like a ripe avocado. 3. Let it cool. Then slice it in half and remove the seeds. 4. Finally, use a fork to shred it and make spaghetti! Where do you buy the sausage? i could not find it so i bought regular turkey breakfast sausage. i plan to sprinkle Italian seasonings on it. Hi! Hmmm…I can usually find the sausage in any grocery store. My favorite is from The Fresh Market, but don’t get to go there much. I would add italian seasoning and maybe some crushed red pepper! Also- this is written for 4 servings, so divide it into 4 portions for the container count!! Hope this helps!! How do you count containers after its cooked ? Like when you are serving it? I haven’t tried to freeze it, but it reheats very well! You can also prep it, keep it in the fridge, and then bake it when you are ready! I made this last night and found so much liquid in the bottom of the pan. I also had a very hard time figuring out some of the directions or lack of them. Everyone really liked it but those were my issues with this dish. 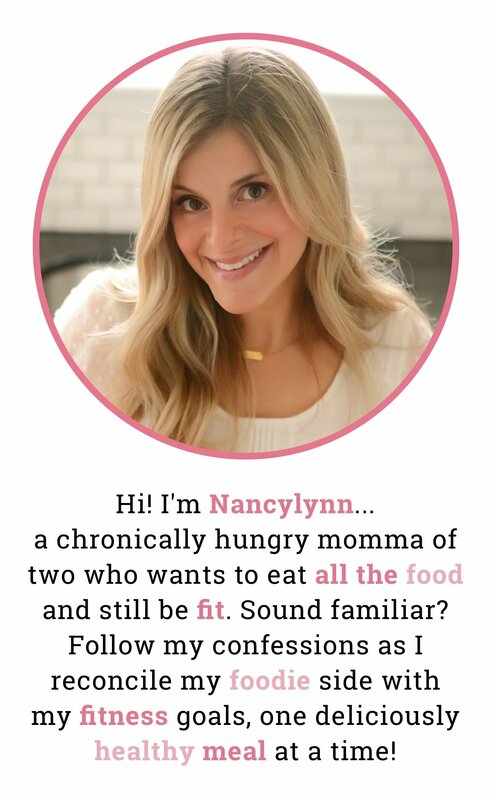 Hi Nancy – thank you for your feedback! I will take a look at the directions to see how to improve them for other readers. Also, you can use cheese cloth or a clean kitchen towel to remove some of the liquid from the squash. Hope that helps!! Thanks!! Do you know the calorie count in this dish? It was delicious btw- my whole family loved it! Hi! I actually don’t count calories, so no…but I have been getting a lot of requests for this. Maybe I will have to add this info in the future! Try loading it into my fitness pal. So happy it was a hit!! What size casserole dish do you use to make 4 servings? Does it make a difference (probably a naive question haha!)? Hi! Not at all – that’s a good question! I use an 8×8 pan and divide it into 4 squares. I used a 9×9 pan by mistake. 1/4 of this for one serving seems insane!!!!! Yup – that’s one of the reasons I love this meal so much! Enjoy :). If you use a jar of container for the sauce and count it as a purple, then what is the container colors used for 1/4 size? Is it still 1 green, 1.5 red, .5 blue, and the 1 purple? When using jarred sauce, what would total colors/number of containers be? Does your jarred sauce have added sugar? If not, it’s still a green! So, what colors would I have used? So I made this last night and WOW is it ever good! The spaghetti squash I found were so small, so I got two and that was perfect. 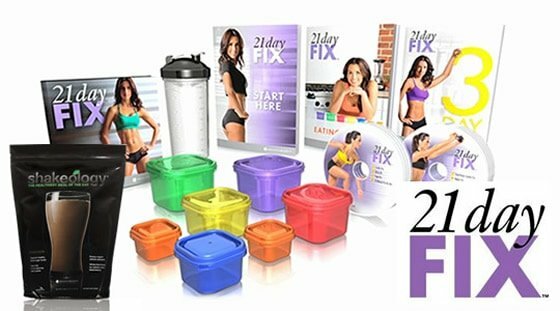 My husband and I both are on the 21 day fix diet. 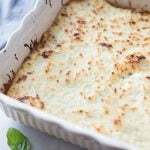 We are thrilled to have found this recipe and your site! Thank you so much. Oh and mine was not to runny, it was perfect! Thank you so much for the wonderful message! So glad the recipe worked out! Happy holidays to you! This sounds great but I’m not a sausage fan. What do you think about ground chicken or beef instead? Thanks so much!! Either would be wonderful! Just season the meat with some Italian Seasonings and garlic powder. YUM! I noticed you have how many containers it counts for but what’s the serving size? How much do you eat to account for the containers listed above? It’s 1/4 of your pan! It’s huge! Tried this last night and it is great!! Yay!!! SO happy to hear!! I tried this last night and absolutely LOVED IT! I used about 2 cups of my homemade marinara sauce (I am a huge fan of everything SAUCE), and I used some extra cheese, too. OH and I used ground beef instead of sausage. My spaghetti squash also likely yielded more than 4 cups of squash – I will definitely have 6-8 servings in my pan (I measure each serving about 1 1/4 green container or so). IT IS SO DELICIOUS. (I even forgot to squeeze the water out of the squash before baking and it still turned out great). I think it’d be hard to go wrong with this recipe!! 😀 Thank you! Thank you SO much, Brooke!! 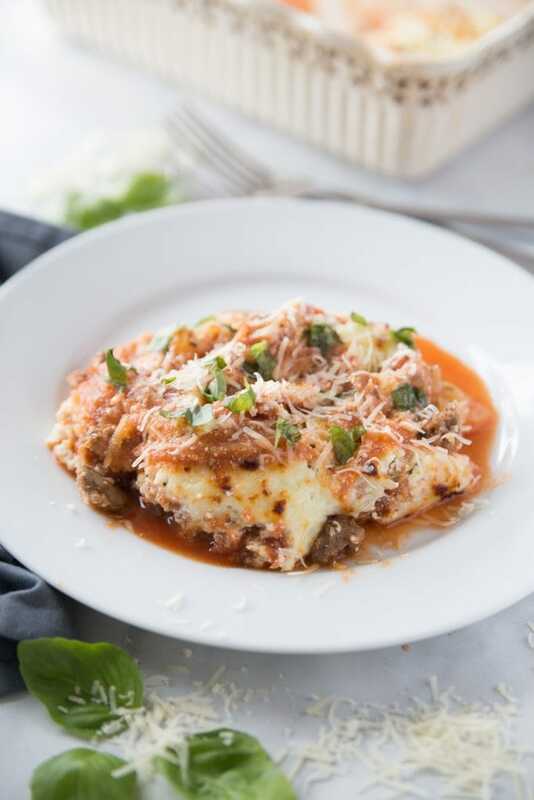 I also LOVE this with ground beef and so does my hubby!! Happy you have some extra for leftovers this week, too – that’s always the best. Thanks for making my night!! 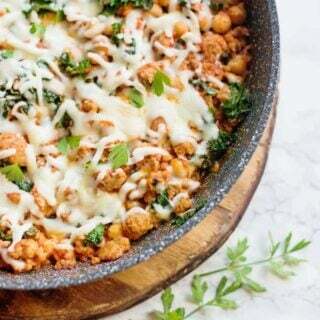 Would this recipe work with ground turkey? It sure would! Season it up with some Italian seasoning and garlic powder – yum! i never saw where to add the onion to the recipe….did i miss it? ahhh…nevermind saw it before the sausage….sorry!!!! Hi there, I’m still a little confused on the containers. If it’s homemade sauce with no sugar, is the squash and the sauce adding up to 1 green per serving or would it be 2 greens then? This was delicious with ground beef for my bland taste buds. The full bowl while doing the Fix is a great thing. We love it with beef, too!!! SO happy you enjoyed it!!! 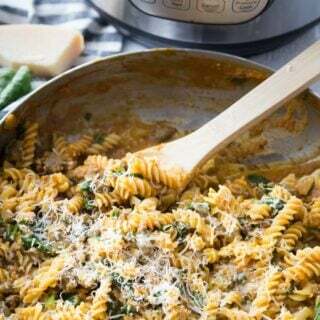 Hey just made this tonight I used a 9×13 pan what would be my portion ? It sounds crazy, I know, but a serving is 1/4 of the recipe…so divide your pan into 4 equal parts! YUM! Made this tonight and it’s awesome! Did what you said and soaked up excess water from the squash and it came out great! Used the left overs for meal prep for the week! Thanks! But aside from the weird layering issue, the flavor is really good when I mix it all together! Will definitely try this again! Hey – so after making this again different ways, we decided we liked the cheese best on top, so I changed the directions. Maybe what I will do in the future is give two options? Thanks for your feedback!! Ohhhh okay! Thanks for the explanation! I thought maybe I was going crazy. 😉 But regardless of the order of the layers, it was so tasty and I’m looking forward to leftovers tomorrow! No problem – you bring up and great point and I think other people may have had the same confusion! Glad you still enjoyed it! I am still confused, in what order did you do the layers in the pictures? Potatoes at the bottom, the the trivet, then carrots and the meatloaf on top. I just found this recipe on Pinterest and made it tonight. It’s amazing! My husband and three year daughter loved it, too. I used the 21 Day Fix sauce recipe and it turned out great. The tip about ringing the squash in a dishcloth was super helpful as well. I seriously haven’t loved a new recipe this much in a long time! Thank you so much and keep up the great work! YAY!! I need to redo these pics, but thank you for making it despite the not so pretty photography! And I am so happy it was a hit with the whole fam…that’s the BEST. So Good! Was a little liquidy, but probably because I used cottage cheese instead of ricotta, and we didn’t mind. I also used half spaghetti squash, half riced cauliflower. I love the idea of adding riced cauliflower!! Thanks, Christina! Love this recipe! Especially for our gluten free family!! Quick question, have you or anyone tried making ahead and freezing? Does it turn out ok? Thanks! I have not tried this, but I am curious to see if someone else has!